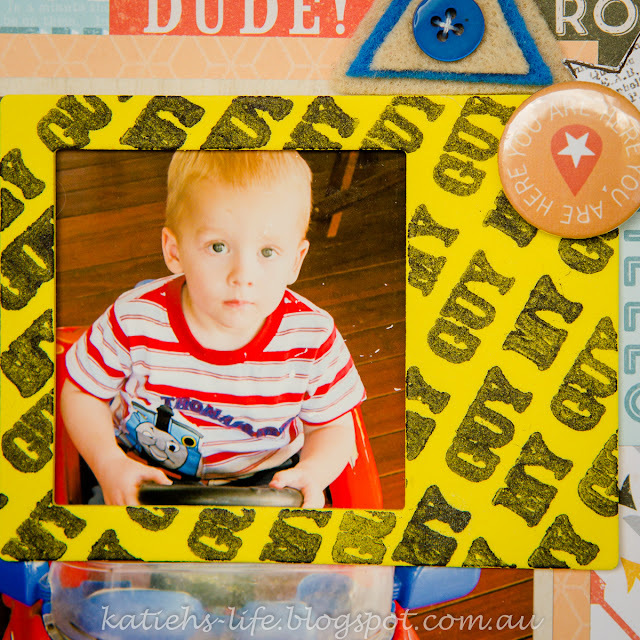 This week is my first "official" week of sharing over on the Rainbow Splendour Facebook page. I decided to mix a bit of old and new goodies on this page and also do a bit of altering to show you how you can jazz up something older to make it like new again! I call this my "made in Australia" page, and my reasoning behind that is the page is full of Aussie goodies. From the obvious Rainbow Splendour embellishments, to the Cocoa Vanilla paper (and some extras), Flutterby Designs stencil and Colour Blast texture paste. It goes to show we have a thriving industry here that needs supporting! Isn't the colour on that texture paste divine?! This colour is called "just blue" and there is a gorgeous pearly glimmer too. 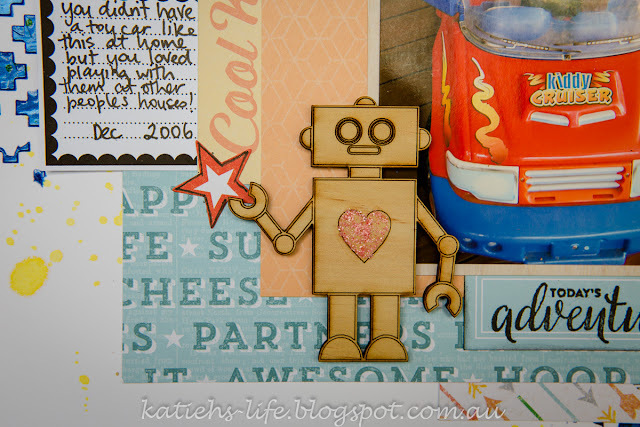 Did you grab one of the cool little robot wood veneers in the last sale? He is so cute, I coloured his little heart in with stickles (worn lipstick if I remember the colour correctly!) I thought he was a good addition to this page with my boy when he was just a little tyke. And check out the "older" polaroid frame. I jazzed it up by repetitive stamping using stayz-on ink. The stamping isn't perfect, but it does the job! I will be back later in the week with another share. Thanks for stopping by. New Month, New Year, New Challenges!